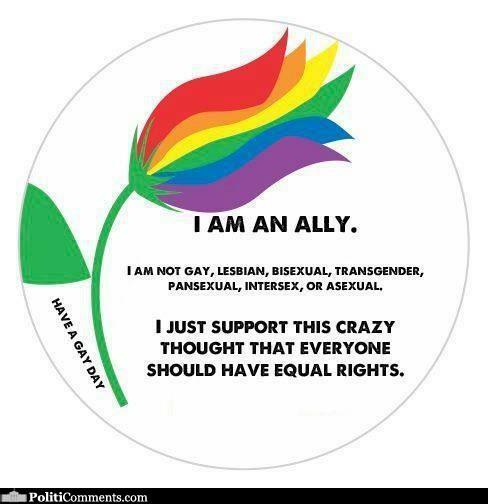 I am an ALLY, are you? I was just about to write about two Endangered Birds this morning, when this came in my email. The Birds can wait until tomorrow, this is much more important to me and millions of others around the world. First let me say, that I have felt this way since the 60′s, when I lived in L.A., long before it was fashionable to do so. It was the time of flower children, free love, inspirational speeches and thinking, yes some of it was quite radical as well, and also sadly, way too many really bad drugs. It was more importantly, a time of a different kind of attitude toward others. Did the Viet Nam War/Conflict have anything to do with this, probably. We were all so very young and so very scared. We were afraid of the violence that surrounded us daily and sought what we thought was a better way to be live, to be. It was a time of gathering of minds, souls and bodies in support of one critical idea, Peace. We desperately searched for this state of being that was seemingly just out of our of reach. It was the time of, Hair, the musical that defined an entire generation, and was dedicated to the idea of loving everyone, we were all the same, no color, or sexual or racial lines, we were united in our determination to stop the prejudice, the violence, the hate and most importantly the killing. So, today when this came, it simply had to be addressed immediately. It is who I and millions of others, who were reared up in L.A. in the 60′s, are/were. I am now and will forever be, AN ALLY. Won’t you be as well? And for those who keep asking, I am not a Gator Woman, it is a pseudonym used at WordPress for my Gravatar.